Summer is the time most people want to spend outdoors, especially when the weather is hot and sunny. However, this beautiful weather could easily lead to dehydration among the elder population. 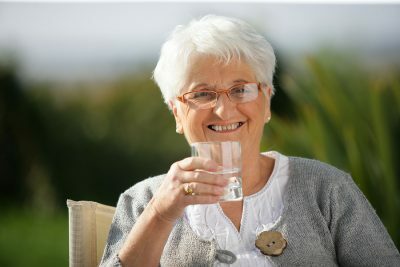 Older adults become dehydrated much easier than any other age group because they are unable to recognize feelings of thirst. Also, adults over the age of 60 are able to retain less water than they did in their younger days, making them lose water in their body much quicker. Seniors with other health problems may have symptoms or be on medications that increase the chances of becoming dehydrated. There are several ways your loved one can combat dehydration and stay healthy this summer, with the help of a family member or elder care provider. Drink water throughout the day. Drinking small amounts of water throughout the day will keep the elder hydrated for longer periods of time than just drinking one large glass of water. Avoid drinks and food that will dehydrate them. Coffee, alcohol, and high-protein drinks will cause the body to lose water quicker because of its diuretic effect. Carry water with you at all times. Since older adults usually can’t tell when they are thirsty, a senior care aid could constantly remind them to take a sip of water throughout the day by having a water bottle close by. Eat foods that are high in water. Another excellent way older adults can get their daily amount of water is through fruits and vegetables that have a high level of water. Watermelon and cucumbers is just a couple of the foods that will keep your loved one hydrated. Help the elder overcome a fear of incontinence. Some seniors are afraid that they will have incontinence issues by drinking too much water. Remind them that it is not the water that causes incontinence, but the time of day they are drinking it. A family member or elderly care provider should limit the amount of drinking the older adult does before bedtime in order to prevent incontinence. If you fear your loved one is becoming dehydrated, watch for the following signs. These symptoms should be taken very seriously because they could cause the elder to have a more serious health problem if their dehydration is not taken care of. They should also be taken to the emergency room in order to make sure they get the fluids their bodies desperately need. If you or an aging loved one are considering elder care in Marlboro Township, NJ, please contact the caring staff at Lares Home Care 1-800-781-7435 or 732-566-1112.